The three mechanical lift configurations, straddle, cantilever, and 4-post, each have their advantages. You will need to determine your necessary load capacity, frequency, and loading/unloading requirements to choose which configuration best suits your project. Best suited for multi-level use, faster speeds and high frequency cycle rates. ‘Standard’ Mechanical Straddle (MLS): Lift Capacity up to 6,000 lbs. ‘High-Load’ Mechanical Straddle (MLS): Lift Capacity up to 12,000 lbs. The cantilever configuration permits the choice of loading/unloading patterns "C", "Z" or 90° load patterns, used for low overhead clearances and tall loads. 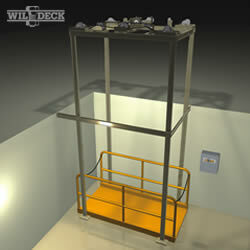 ‘Standard’ Mechanical Cantilever (MLC): Lift Capacity up to 5,000 lbs. 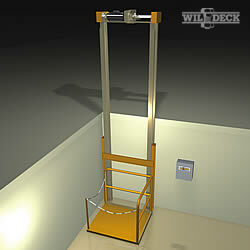 ‘High-Load’ Mechanical Cantilever (MLC): Lift Capacity up to 10,000 lbs. Best suited for multi-level use, faster speeds and high frequency cycle rates when moving heavier loads. The 4-Post Material Lift configuration allows the flexibility to load/unload on any side of the platform. Excellent for large, heavy loads. 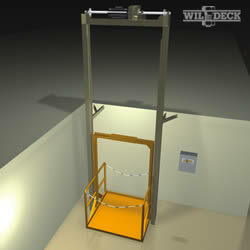 ‘Standard’ Mechanical 4-Post: Lift Capacity up to 15,000 lbs. ‘High-Load’ Mechanical 4-Post: Lift Capacity up to 30,000 lbs.